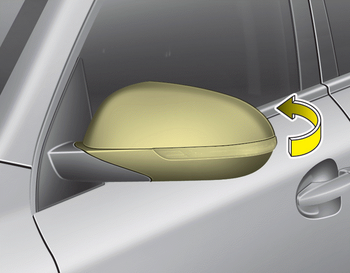 The outside rearview mirror can be folded or unfolded by pressing the switch as below. Left : The mirror will unfold. Right : The mirror will fold. - The mirror will fold or unfold when the door is locked or unlocked by the smart key. 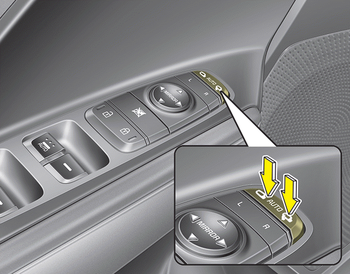 - The mirror will fold or unfold when the door is locked or unlocked by the button on the outside door handle. The electric type outside rearview mirror operates even though the ignition switch is in the LOCK position or the engine Start/Stop button is in the OFF position. However, to prevent unnecessary battery discharge, do not adjust the mirrors longer than necessary while the engine is not running.